It's the Philippines AirAsia RED HOT PISO SALE again! - All Chucked Up! 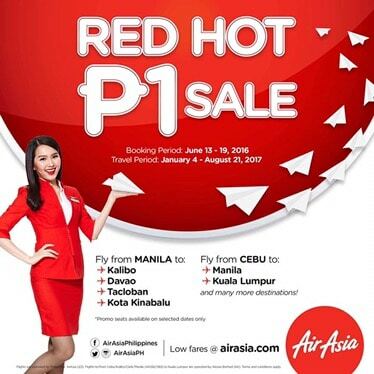 You are Here >> Home >> Promos >> It’s the Philippines AirAsia RED HOT PISO SALE again! Starting from a base fare* of P1.00 only, excluding taxes and fees, guests can fly to/from Manila, Davao, Kalibo/Boracay, Tacloban, Tagbilaran/Bohol, Cebu and Palawan in the Philippines while international flights from Manila to Shanghai, Macau, Hong Kong, Kota Kinabalu, Kuala Lumpur and Seoul are also in sale with base fare from as low as P949 only. The promotional seats are available for booking from 13 to 19 June 2016 for the travel period 4 January to 21 August 2017 on AirAsia.com and mobile app. Flights to any of the more than 120 destinations in 24 countries served by AirAsia and AirAsia X are also included in the promo sale. Guests can take advantage of the FlyThru service from Manila, Cebu and Kalibo to seamlessly connect to any destination in AirAsia’s network within one stop via multiple transit hubs, without having to pass immigration and with their baggage checked through to the final destination. Philippines AirAsia strongly encourages guests to pre-book baggage allowance at the time of flight booking to enjoy the lowest rates. Guests can also use pre-book or add baggage allowance using the Manage My Booking function on AirAsia.com up to 4 hours before departure. Guests are reminded that each passenger is only allowed one piece of carry-on cabin baggage that must be at most 36cm (h) x 23cm (w) x 56cm (l) and weigh no more than 7kg. Keep updated with AirAsia’s latest promotion and activities via twitter (@AirAsiaPH), Facebook, Instagram (@AirAsiaPh), and on Viber public chat (@AirAsiaPh).